NETWORK UPDATE: There were 0.1 bumps for WHAT WOULD YOU DO, the new episode of WHOSE LINE IS IT ANYWAY and the rerun of THE BRIEFCASE, but THE MESSENGERS lost 0.1 in final numbers. CABLE HIGHLIGHTS: Discovery’s ALASKAN BUSH PEOPLE dominated Friday cable at 0.97, despite a 0.11 decline from last week. Lead-out CATCHING MONSTERS was at 0.37. Adult Swim’s CHILDRENS HOSPITAL was the night’s #2 original, down 0.02 to 0.50. MARRIAGE BOOT CAMP declined 0.03 to 0.45. 3 family shows placed in the Top 10, with Cartoon Network’s ADVENTURE TIME at 0.41, and Disney’s JESSIE and GIRL MEETS WORLD at 0.40/0.39. On Food Network, AMERICAN DINER REVIVAL was up 0.09 to 0.40, and DINERS, DRIVE-INS AND DIVES upticked to 0.39. The top live sports event was a USA MEN’S SOCCER MATCH at 0.33. History’s HANGAR 1 rose 0.03 to 0.27. FOR BETTER OR WORSE (OWN) climbed 0.06 to 0.27. COLD JUSTICE (TNT) gained 0.07 to 0.26. 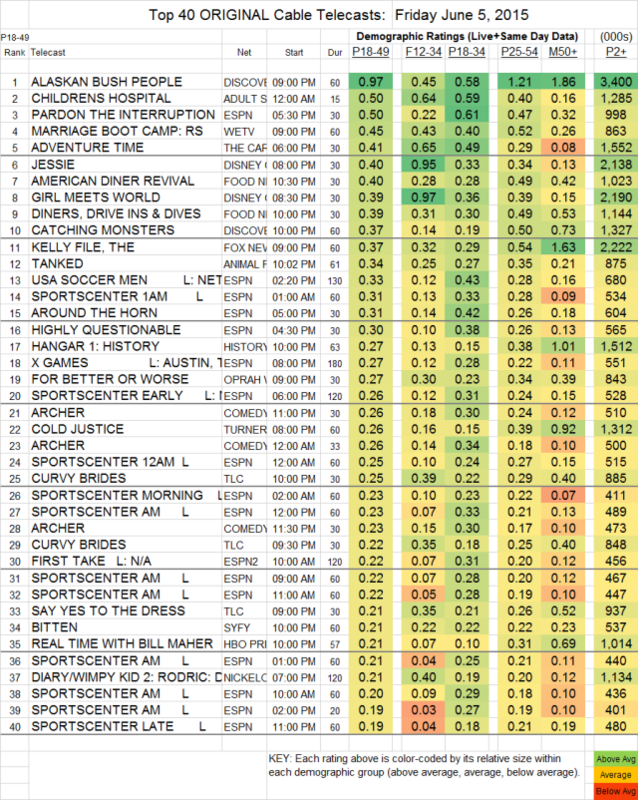 On TLC, CURVY BRIDES was at 0.25/0.22 (down a hundredth or two from last week) and SAY YES TO THE DRESS was up 0.02 to 0.21. Syfy’s BITTEN jumped 0.09 to 0.21 at 10PM, with an additional 11PM hour at 0.16. HBO’s REAL TIME WITH BILL MAHER was at 0.21, with VICE at 0.14. THE SOUP (E!) was at 0.18.